Arena retains a log when exceptions are generated. While most exceptions display on the user’s screen when they occur, Arena records a log of the exception. Some exceptions, like Access Restrictions, do not display. Arena can also send an email to the designated recipient if the Send Exception Organization Setting is set to “True,” and if there is a valid email in the Exception Recipient Organization Setting. 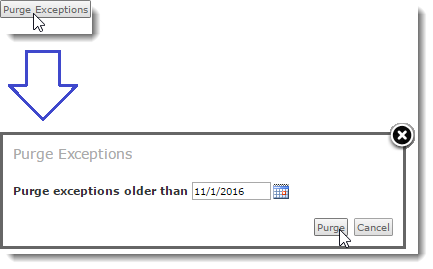 You can filter the Exceptions by entering criteria such as a date range in the Filters area and then click the Apply Filter button to view the filtered Exceptions. •Click the Exception Number link to display the exception details. When contacting Arena Support with exception issues or questions, you need access to this page. 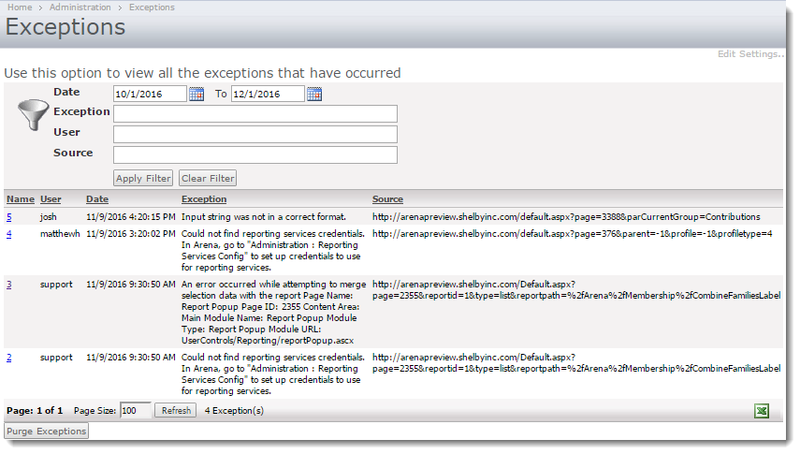 •Click the Purge Exceptions button to remove the exceptions from the listing. While it is not expected for you to know how to resolve exceptions, many exceptions include enough information to resolve the exception. In the below example, page 3154 was missing the required ACH Payment Gateway provider.